Every morning at 9am Sherri from the Exuma Park office comes on the VHF and arranges the assignment of mooring balls for the day. You can call in on the radio and request a ball one day in advance of your arrival and you will be put on the waiting list for the next day. If you are lucky, they may have space that day and you can make your way that morning. Sherri starts by calling for boats that are leaving their mooring that day so she knows how many are available and then starts assigning those balls to the boats on the waiting list. We liked listening each morning to hear if there were any boats coming in that we knew. 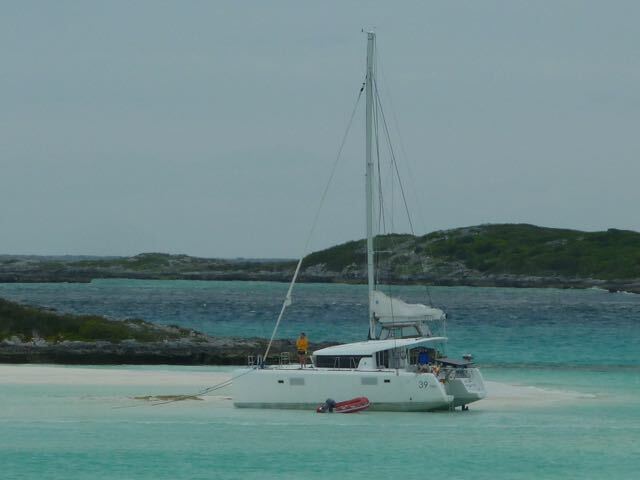 Part way through our stay in the park we were in the dinghy on the way back to the big boat, when we noticed there were a few dinghies circling this Catamaran, just behind Grace V. We headed over to see what was happening and if we could help. As it turns out they had been making an approach to the mooring ball behind us and missed catching the mooring line. They put the boat in reverse to try to pick up the line when they backed over their dinghy painter and wrapped the line around their prop taking their Starboard engine out of commission. 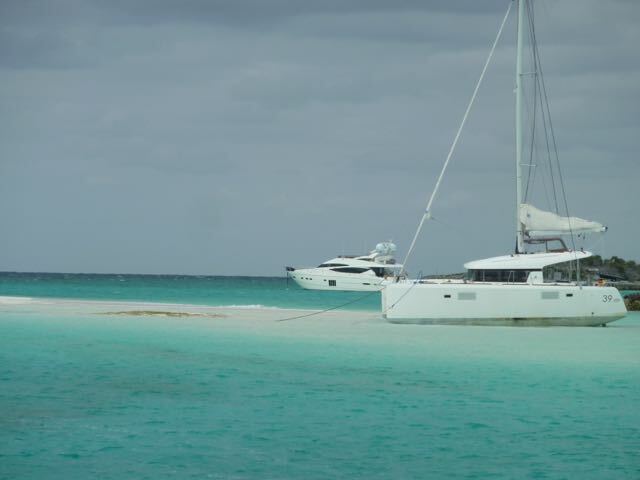 Without the starboard engine, they drifted quickly and ran aground on the sandbar surrounding the mooring field. Along with three other small boats we tried to push and pull the Cat off the sandbar as the tide was falling. We finally gave up and the crew on the Cat put out a couple of anchors and settled in to wait for high tide. 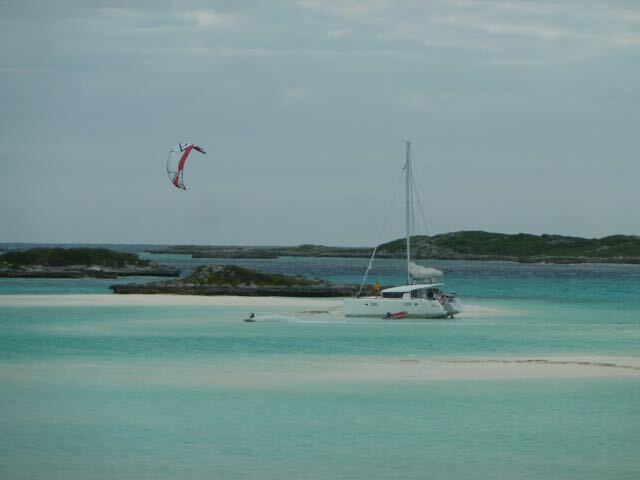 Kite surfer doing a fly by the marooned Cat. You can see the sandbar revelling itself. This is dead low tide. High tide came at 9pm that night and the crew retrieved their two anchors and this time picked up the mooring ball, in the dark.